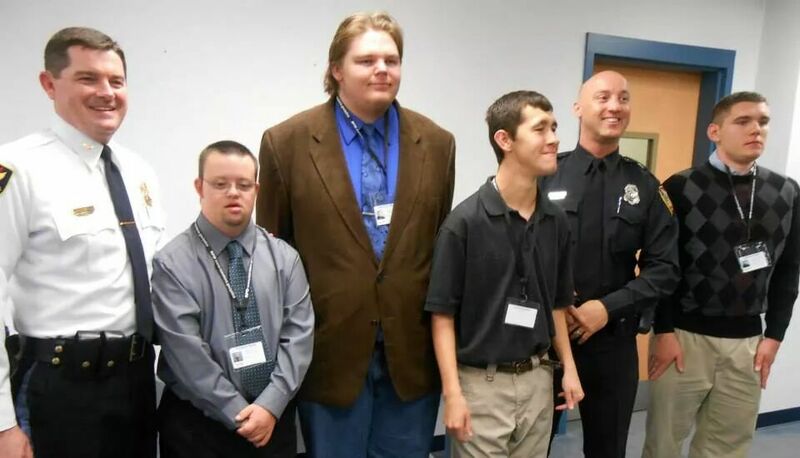 On November 10, 2014, the Roanoke Police Department held a press conference to officially launch GTO CADETS—“Grow Through Opportunity.” The GTO CADETS program allows young adults with disabilities to intern within the department. 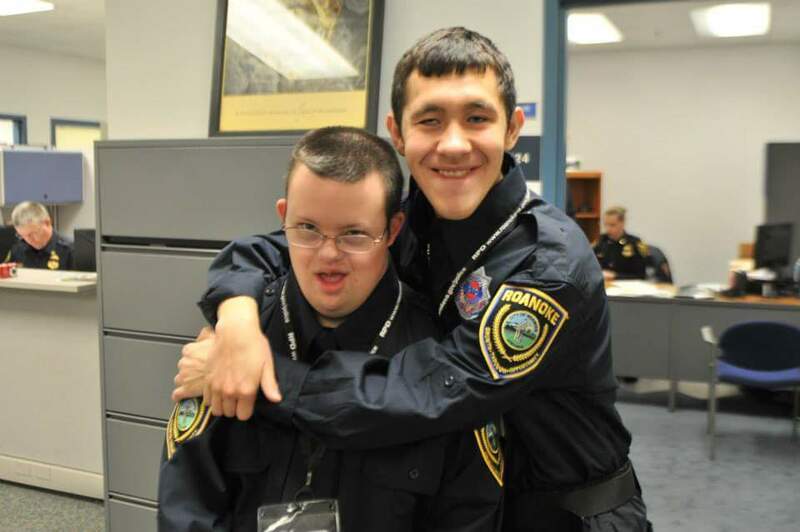 Cadets grow their professional skills and round out their resumes, and simultaneously provide law enforcement officers with coworkers with disabilities. Officer Travis Akins worked closely with Chief Perkins to incorporate GTO CADETS into department life, establishing an internal policy and volunteer application process. The inaugural class included three young adults with Autism Spectrum Disorders and one with Down syndrome. A professional job coach, contracted through the Commonwealth of Virginia’s Department of Aging and Rehabilitative Services (DARS), is on site Monday through Friday to ensure GTO CADETS get the most out of their time with the department. What exactly are GTO CADETS doing with their day? After being outfitted with custom-designed GTO CADET uniforms—including badges—cadets complete tasks such as filing documents, shredding papers, copying and folding safety brochures, and providing department tours. Working up to 12 hours a week, each cadet receives assignments that play to their strengths. For example, one young man with autism disseminates daily assigned patrol vehicle keys to officers beginning their shifts. The position—which did not exist before the program—requires officers and detectives to sign for their patrol keys, ultimately both enhancing accountability and forcing interaction between officers and cadets. GTO CADETS are also provided high community exposure. They assist the department with crime prevention presentations; role playing, co-training and molding the minds of young recruits in the police academy; acting as “McGruff the Crime Dog” for Senior Centers and elementary schools; changing Project Lifesaver transmitter batteries and bands on individuals with cognitive impairments who may wander; and riding in police vehicles in Christmas Parades and other popular events—in short, they act as a new face of law enforcement. Recently, a GTO CADET with Down syndrome co-presented with the Police Chief at a Bar Association luncheon. The cadet was responsible for the portion of the presentation focusing on the GTO CADET initiative. Finally, each GTO CADET shift ends with 30 minutes of cardiovascular training in the department’s fitness facility. Officers in the department have noticed preconceived perceptions morphing into positive interactions, empathy, and camaraderie. Police personnel expect to see the GTO CADETS around the building and look forward to daily interactions—many employees see the GTO CADETS as the highlight of their week! The Department is now totally committed to an inclusive work place, and increasing job, life, and social skills for young adults with disabilities. For assistance implementing the GTO CADETS program, e-mail Officer Travis Akins at GTOcadets@gmail.com or call at (540) 632-7326. Follow and Like GTO CADETS on Facebook. This entry was posted in Criminal Justice and tagged NCCJD. Bookmark the permalink.